Wheel of Fortune Slots - Review & play for FREE! You can't help but get excited to play Wheel of Fortune Hollywood slot machine, an online version of everyone's favourite classic television show. Wheel of Fortune is a 5 pay line machine. Before you begin playing you might like to be directed to the payable located on the bottom right hand side of your screen. Here you will find the different combinations for a winning spin and its worth. Wheel of Fortune also offers you the opportunity to play for free before you commit to challenging your trivia knowledge! To begin playing, select your line bet. You can do this by using the increase and decrease button on the panel at the bottom of your screen. A maximum line bet is £5 and the maximum lines you are able to bet on is 5. Therefore your total maximum stake on any spin would be £25.The minimum bet on a spin can be as low as 5p and minimum lines is 1. 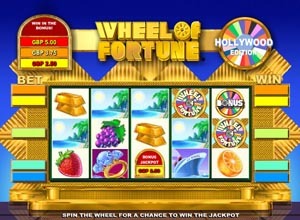 Wheel of Fortune slot game also offers a bonus jackpot. The jackpot stake is listed in the top left hand side of your screen and values three amounts; £2.50, £3.75 or £5, 00. The bonus jackpot can only be won in the ‘wheel bonus'. You can earn the ‘wheel bonus' by spinning the bonus symbol on reels 1,2 and 3 on any live payline. When you activate the ‘wheel bonus' you can spin the wheel for a chance to win one of the listed jackpot amounts. The bonus wheel has a colour coded jackpot segment for each jackpot amount – just like the real Wheel of Fortune! Wheel of Fortune slots is a realistic take on the classic television programme. The colourful graphics and sound effects are guaranteed to keep you entertained. The play button and betting features are easy to use and navigate which makes it easy for you to spin to win and watch your winnings roll in.